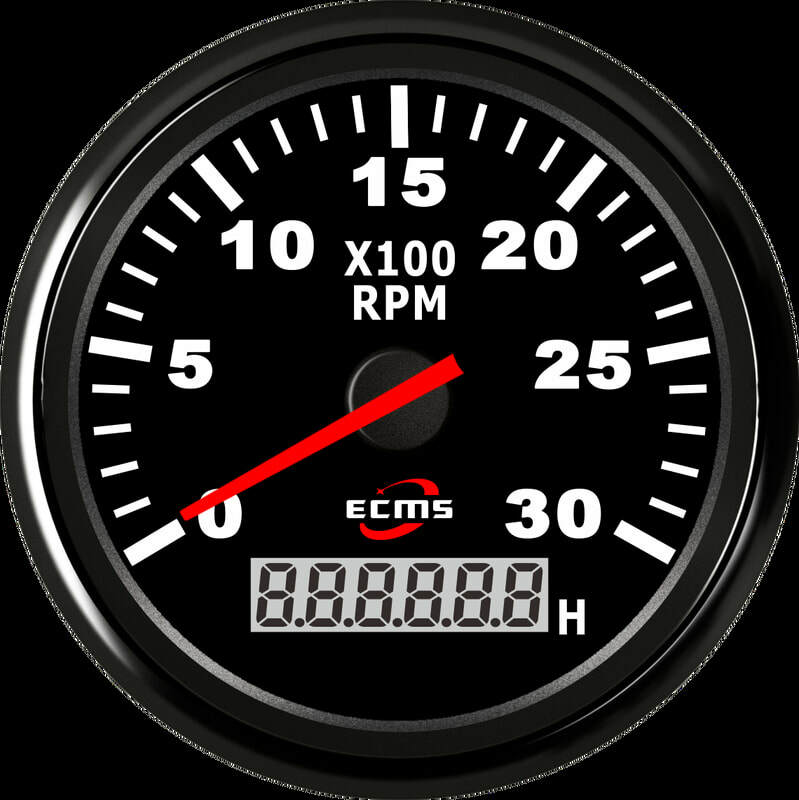 The gauge is 100% water resistant and includes a mechanical rubber seal between the gauge and the bulkhead with outstanding anti-foging. This is a very high quality ECMS gauge that has been designed to give long trouble free service exposed to the marine environment. Bezel material - Plastic coated stainless steel. Input - 0 to 190 ohm. This is a 2 inch (52mm) marine control panel gauge. This Oil Temp Gauge has a flat glass crystal for that retro look. The dial is Black that will indicate the temperature of your oil from 50 to 150C (120 -300F). Input - 361 to 19 ohm. Operating Voltage - 9 to 32 VDC . Minimum rear clearance - 51mm. This Oil Pressure Gauge has a flat glass crystal for that retro look. 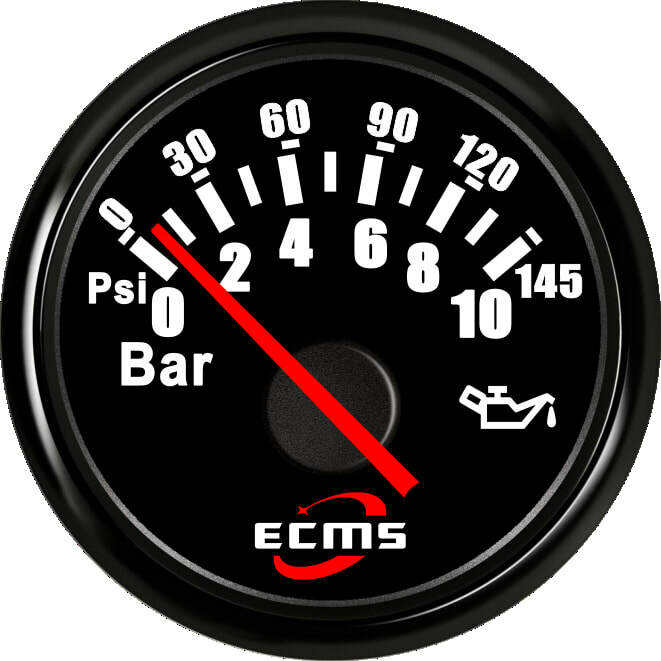 The dial is Black that will indicate the oil pressure (or air pressure) in your systems from 0 to 10 BAR (0 to 145 PSI). The gauge is 100% water resistant and includes a mechanical rubber seal between the gauge and the bulkhead with outstanding anti-fogging. This 12V Volt Gauge has a flat glass crystal for that retro look. 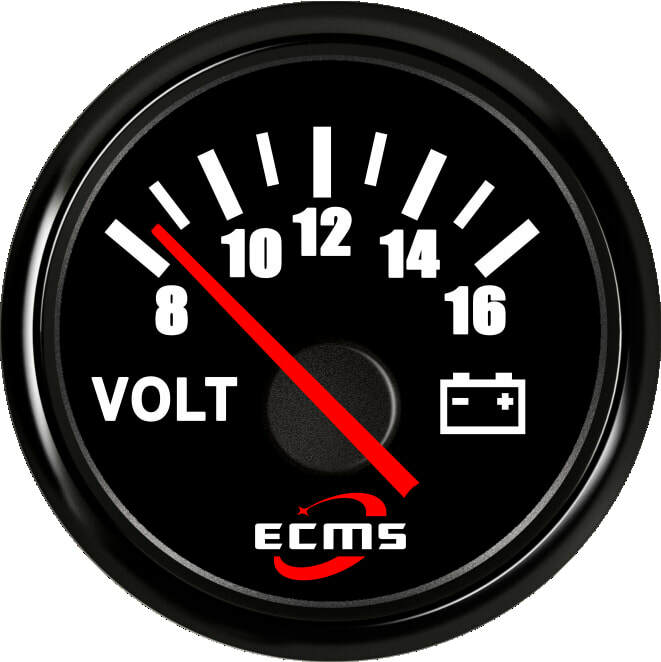 The dial is Black that will indicate the Voltage in your electrical system. The 24V looks and works in the same way except for the number range. Input -9 - 16 volts. 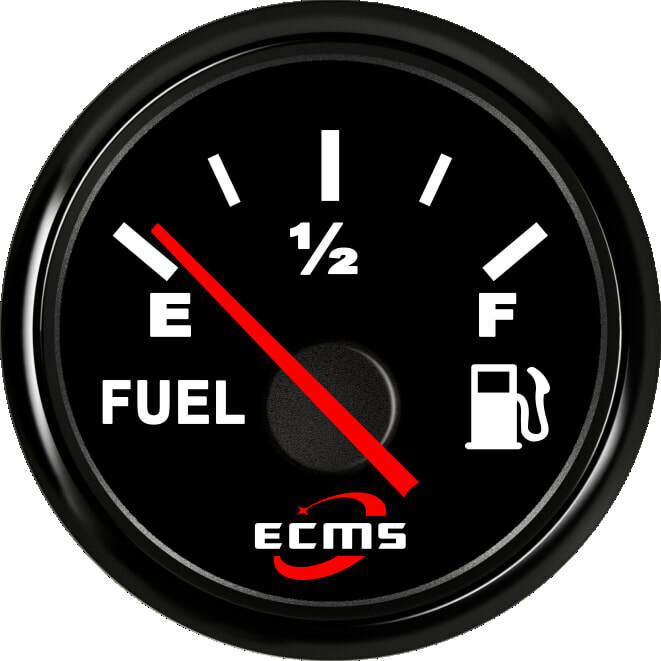 This gauge is available as 3000, 4000, 6000 and 8000 versions. All are identical except for the number range. ​This is a 3.5 inch (86mm) marine control panel gauge. 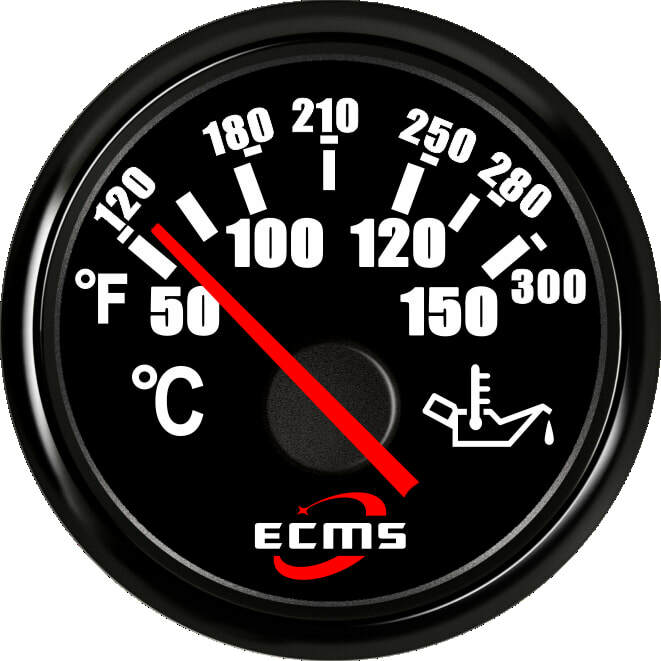 This is a very high quality ECMS gauge that has been designed to give long trouble free service exposed to the marine environment. It is therefore ideal for use in exposed craft such as Narrowboats, Fishing boats, RIBs and Yachts. The crystal is glass and so will not fade as the plastic ones do and the bezel is stainless steel for long life in the marine environment. Fixing method - rear screw thread hand tightened. Minimum rear clearance - 70mm. Input - Pulse from the 'W' output of your alternator or from a speed sensor. Operating Voltage - 9 to 32 VDC automatic voltage compensation. Operating Temperature -30C to +75C. Signal Input Pulse from the 'W' output of your alternator or from a speed sensor. input type - female spade connector.